It is rare that you find a musician with such an erudite voice, a saxophonist with so distinctive a tone; add to that breathtaking control of a colour palette that is used to dramatic effect so conscious of timbre; all of which is used with such aplomb while playing the alto saxophone. Yet such an instrumentalist is Toronto’s Allison Au. What a joy it is to listen to someone so expressive, of such pure musicianship that you feel you are approaching something you’ve never heard before. The excitement of listening to Au is close to making something of a discovery of something precious; making your acquaintance with someone whose sparkling intellect dazzles the senses. Yes listening to Allison Au is an intellectual as well as a tactile experience. Au plays alto saxophone. Her instrument exudes notes that she appears to gently coax from her instrument. In a sense she reminds one of Johnny Hodges – not in terms of tone and unique glissando that the Ellington alum is celebrated for. Au’s playing is much more gentle and airy. Her tone is sometimes moist but it can also be dry when the music demands it. She plays lines as if they were floral whorls in the asymmetrical geometry of her compositions. The lines dart and swerve and they swing as if coaxed by an invisible breeze. And then they fade and die only to give birth to something equally beautiful. But don’t misunderstand that as something too feminine; on Forest Grove at least. Her playing is sinuous, at times even masculine. This is eminently desirable for the listener as many male saxophonists strive to sound sensuous and feminine. This second album by Allison Au plunges her into the natural world once again. She deals with composition in a manner similar to Maurice Ravel – as an impressionist, that is. This does not mean that there is no narrative in her playing. On the contrary there is plenty. The stories plunge the listener into a beautiful world like Monet did (consider the cover of the album, for instance, which is modern, but suggestive of some work done by Monet). Music entitled The Clearing and Through Light suggest canvases that are riveting, and the lure is in the music that paints the picture. Other parts of the repertoire might suggest ethereal portraits and even a title such as You Ordinary Stranger conjures up a portrait of someone quite special actually. They Say We Are Not Here is a fabulous and mysterious piece. It is also the longest one on the disc and it flows from You Ordinary Stranger, which serves to deepen the mystery of the song. Wayne Shorter music is often like this. Perhaps Au has even fashioned this piece in the manner of Shorter. Certainly the leaps that she takes in the lines she constructs and the philosophy of the composition suggests recent Shorter work. 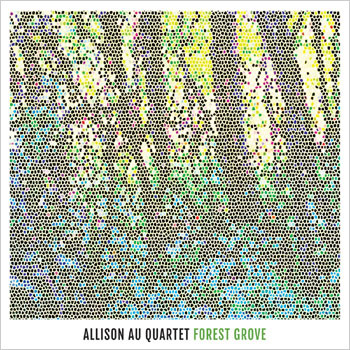 Allison Au has also put together a quartet that seems to feel her music instinctively. There is always something special in hand when your ensemble will absolutely die for you. This is what Todd Pentney, Jon Maharaj, Fabio Ragnelli and especially Felicity Williams bring to your music. Allison Au is fortunate to have players like these to interpret her music, but then she is special too and is a constant reminder that she is so. Track List: Tides; Bolero; Aureole; The Clearing; Deluge; Through Light; Tumble; The Ordinary Stranger; They Say We Are Not Here. Personnel: Allison Au: alto saxophone; Todd Pentney: piano, Hammond B3; Rhodes; Wurlitzer, synthesizers; Jon Maharaj: acoustic and electric bass; Fabio Ragnelli: drums; Felicity Williams: voice (2, 4, and 9).